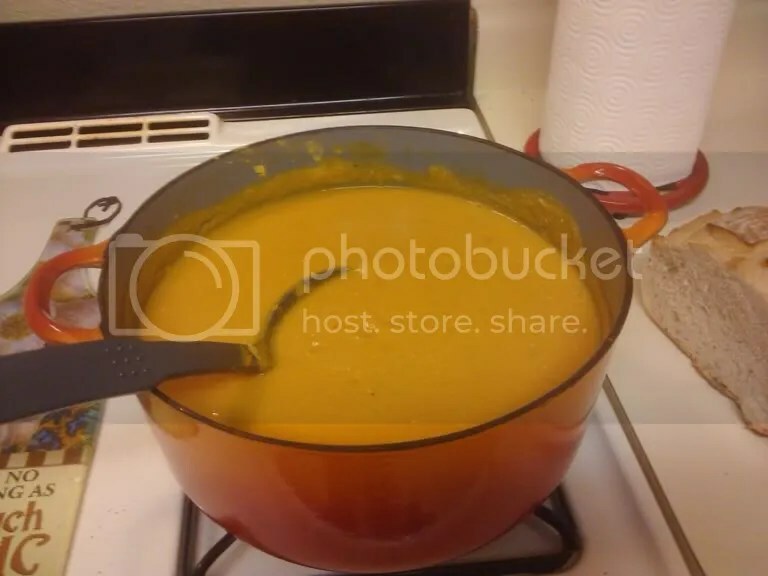 Time for the next From the Stove recipe, and this time we have lentil soup from the great Alton Brown. This comes out absolutely delicious, is great if you’re looking for a non-meat dish, and literally lasts you for days! For two people, it can last you at least 4-5 days. The original Alton Brown recipe can be found here. We’re not too big on celery, so we usually just add extra carrots and another onion. 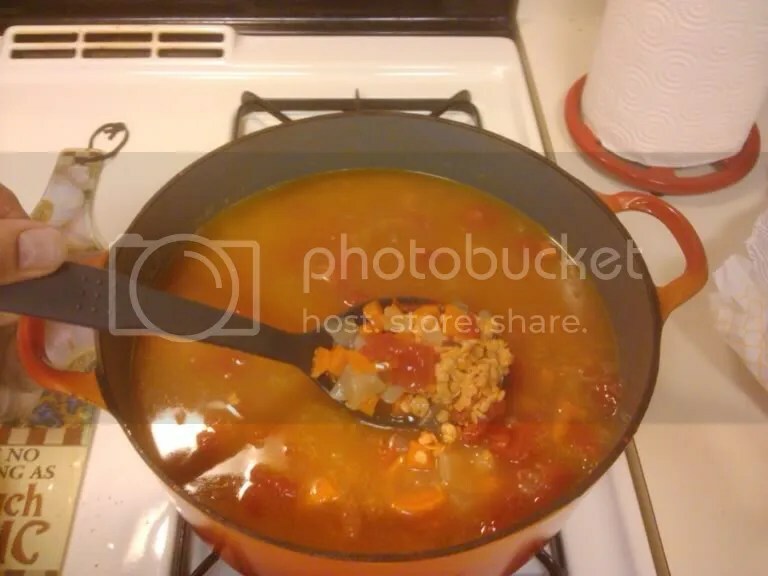 After cooking up the onions and carrots and celery for a little while, you just throw everything in, ending up with a colorful looking stew. 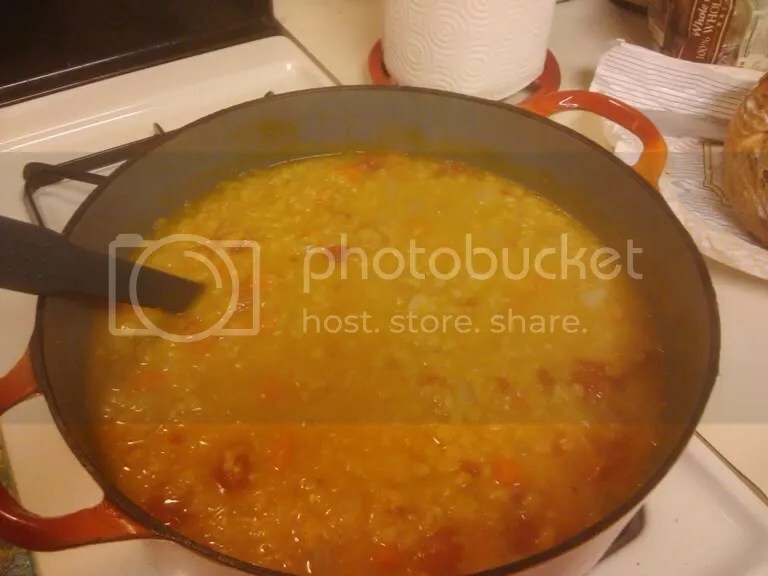 After it cooks for those 40 minutes, the lentils miraculously transform from sad little dry seed-looking things, swelling into a corn-like meal, thickening the dish into a hearty soup. I often think one could in fact just enjoy the soup as it is at this point. But after blending it with an immersion blender, it turns into this wonderfully tasty soup. 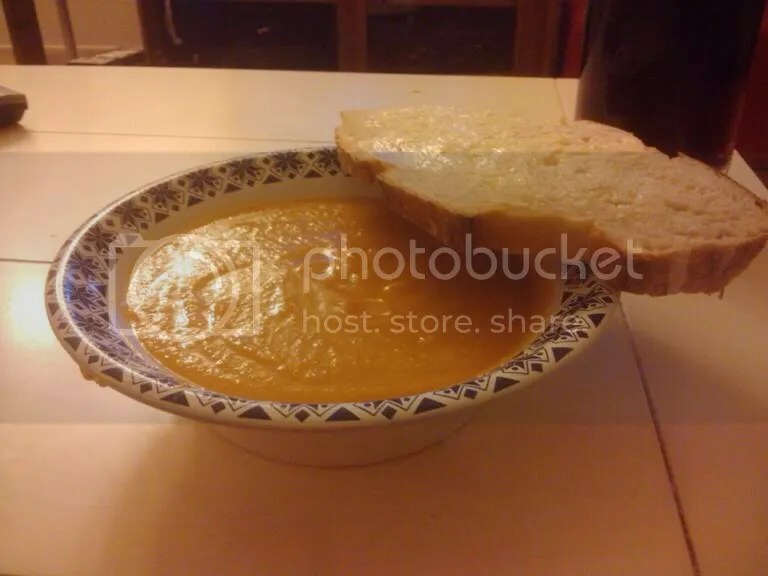 Served with bread, it’s delicious! It’s been a while since I did a “From the Stove,” so I know it’s been overdue. 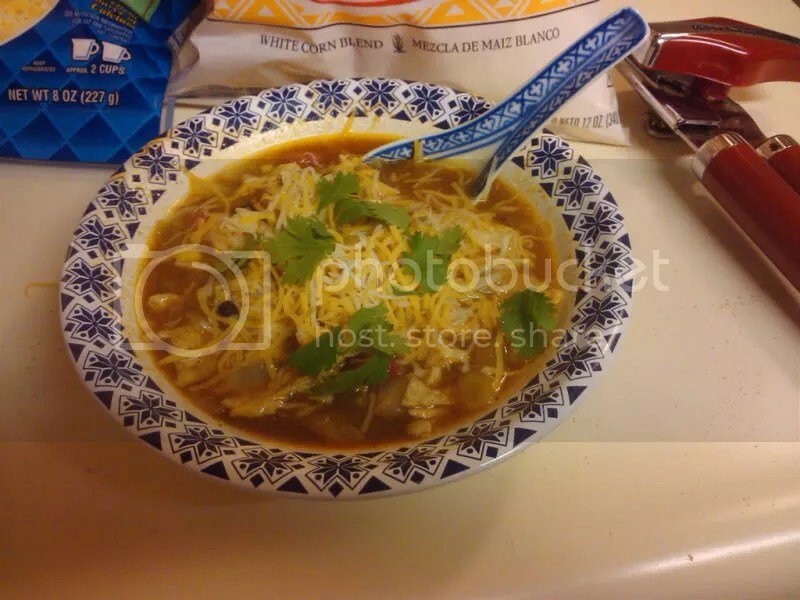 Fortunately, this particular one represents our foray into making chicken tortilla soup, and the results were totally worth it. Came out delicious; so much so we made it again a couple weeks later. 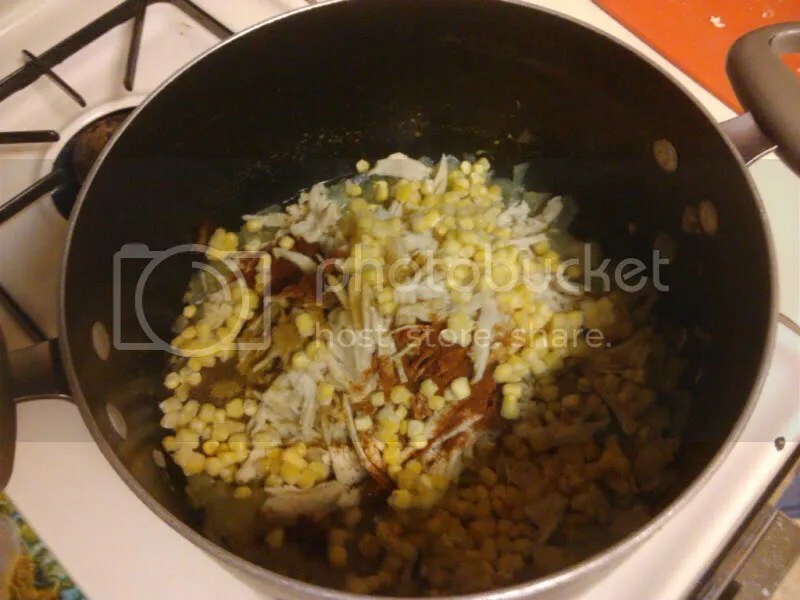 Naturally, the perfect dish never follows the exact recipe, but involves some “tinkering.” In this case, did cumin instead of oregano, and skipped hominy, added more corn. For the fancy “tortilla” effect, we just crushed up tortilla chips, and came out just fine. Here the chicken breasts cook in the delicious smelling mix. The results came out great . . .
For a number of years now, each holiday season, my craving for British mince pies becomes insatiable, and I make it a point to go out and seek these delicious deserts in large quantities. 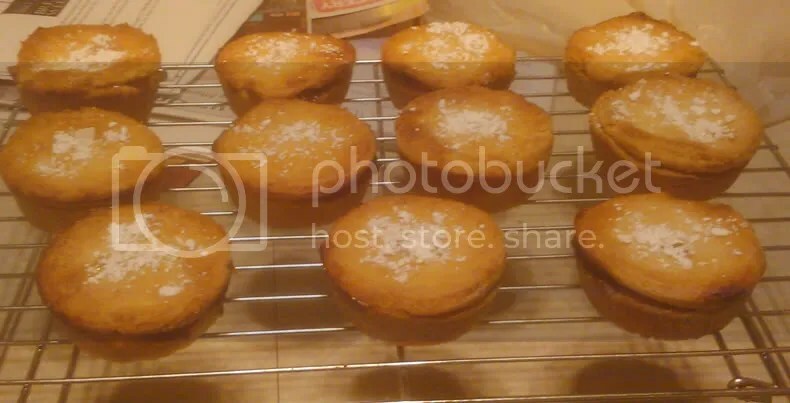 For the last couple of years I’ve managed to secure these mince pies at the A Touch of Britain store, but I have also been saying that I really need to learn to make my own batch, and that way I could have a never ending supply and I’d be saving money too, as they don’t come cheap. 2010 is the year I made this happen. 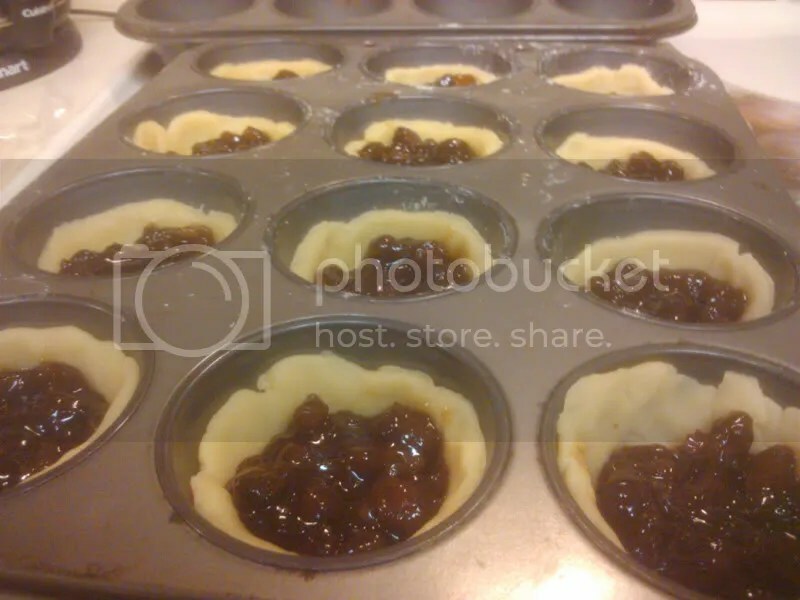 The only thing that can be a little tricky to procure is the mincemeat, though I had no problems this time. After discovering a number of British foods and candies now being carried by Safeway, I asked for help and was shown another seasonal British food section and right next to the Christmas pudding was a big jar of mincemeat. Wrap the dough in plastic wrap and chill for a minimum of 15 minutes, up to 30 minutes. The dough can also be made in a food processor by mixing the flour, butter and salt in the bowl of the processor on a pulse setting. 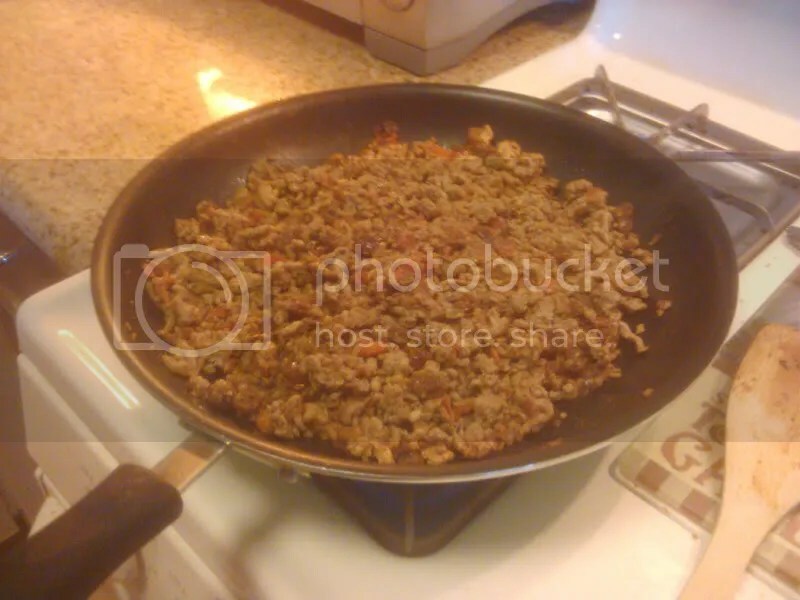 When the mixture resembles breadcrumbs, add the egg a slowly, through the funnel until the dough, then add water a tsp at a time until the dough comes together in a ball. Wrap in plastic wrap and chill as above. Bake in the preheated oven for 20 mins (15 mins if making canape size) or until golden brown. Remove from the oven and sprinkle with the icing sugar. I’ll be honest, the dough did take me some time to get right and required adding a little extra flour to not make it too sticky. 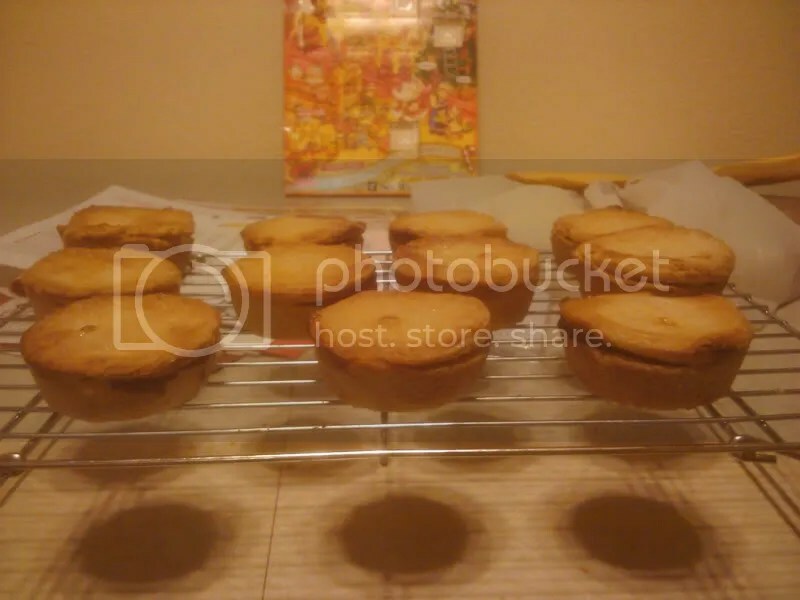 Then it was wrapped up in the fridge for half an hour and then began the rolling and adding of flour, then the re-rolling and adding of more flour, and a number of attempts later, I got the little pies in the tray or tin, and added the mincemeat. After that it was back to the dough board, to make the little tops or “hats” for the pies. With each top I lightly touched around the edge with water to help it stick to the base of the pie. At this point I used a recommendation from another recipe to add a golden topping to the pies, which involved beating an egg with a tablespoon of water and then brushing the tops of each of the pies, finally adding some sugar and then into the oven they went. About twenty minutes later they came out looking golden brown, piping hot, and absolutely delicious. After adding some powdered sugar for decoration (see top photo), they were done. I must say the taste of the fresh, hot pastry with the mince makes it well worth all the work instead of the packaged, preserved variety. 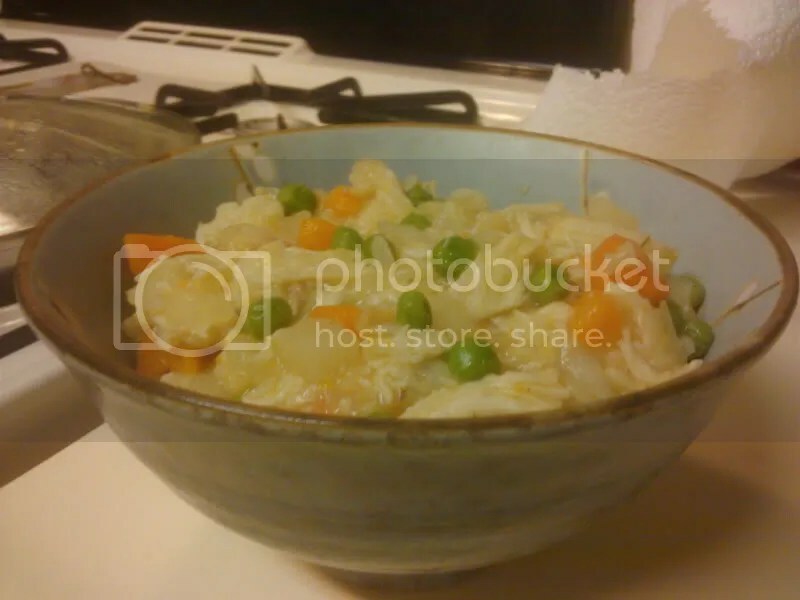 If you want something warm and hearty and also absolutely delicious for this chilly time of year, then look no further than this chicken rice soup recipe; naturally with a few little additions to make it taste even better. This particular recipe is from Epicurious, and is real simple and easy to make for such a satisfying result. Transfer chicken to a colander. When cool enough to handle, remove meat; discard skin and bones. 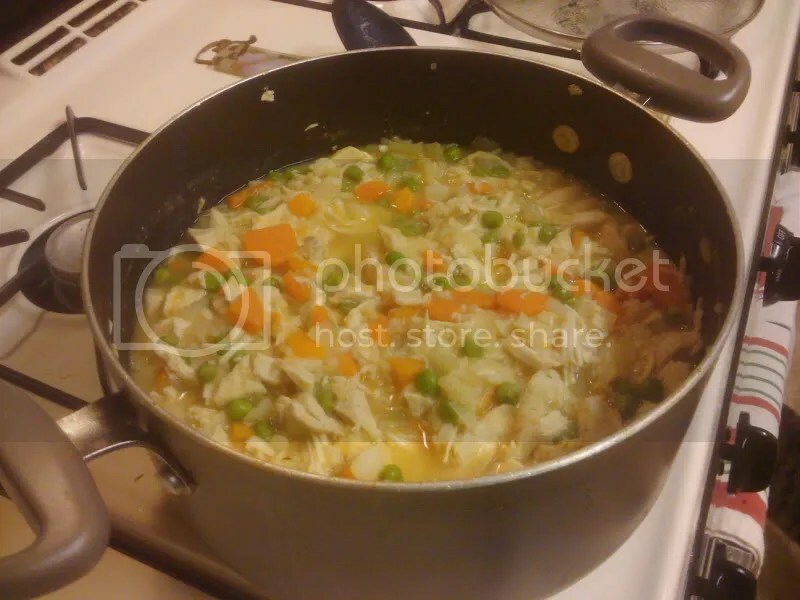 Coarsely shred chicken and return to soup. Add 2 teaspoons salt and pepper to taste and reheat if necessary. – While I’m sure the complete chicken is a good way to do it, we went with the regular old chicken breasts method, did about 3-4 of them. – We’re not too big on celery, so we just did 5-6 carrots instead. 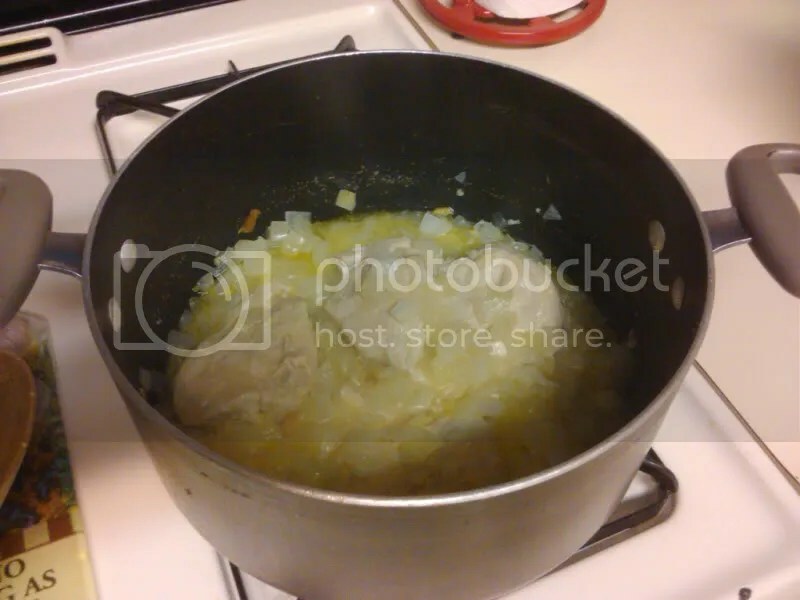 – We also added 3-4 cloves of garlic, because YOU GOTTA HAVE GARLIC. 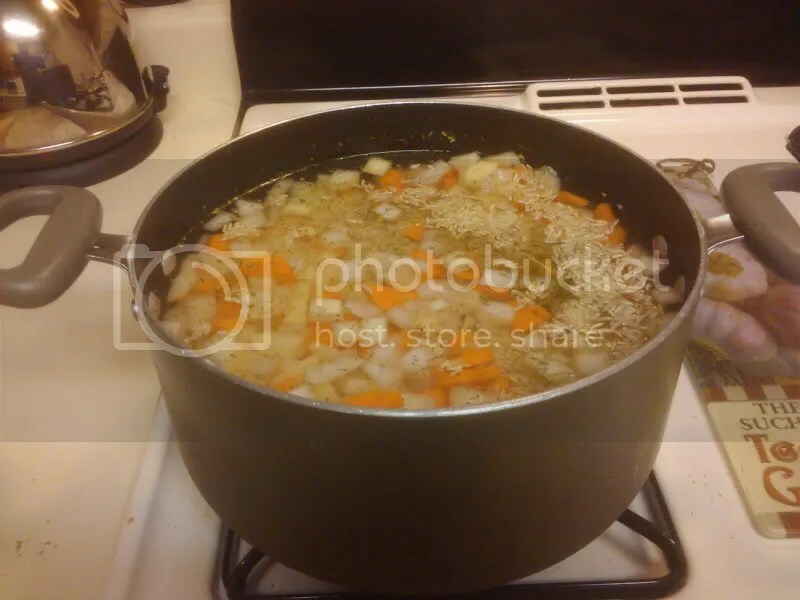 – We knew that plain water would make the whole thing pretty bland, but stock can be expensive when you need so much, so we went with chicken Oxo cubes, ideally you’d want to go with three. – In addition to salt and pepper we added some thyme. 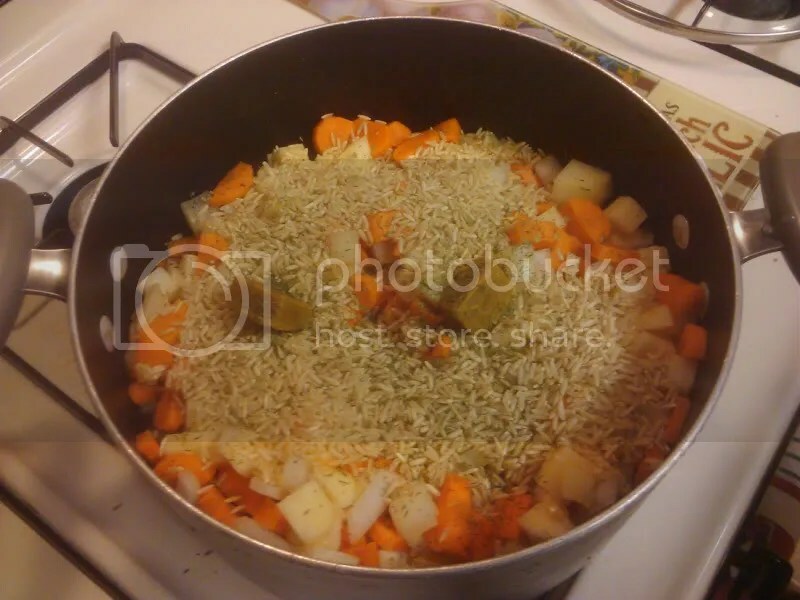 – I recommend, if you go with the chicken breast method, to put them at the base of the pot and then add all the cubed and diced vegetables and rice on top so it fills all the crevices. Then add the spices. That way when you start adding the water to mix with the Oxo cubes, you can get in as much water as possible. The two times we made it, we still couldn’t get the required three quarts of water in. Of course, once you’ve eaten some of it, you can add more water as needed, depending on how soupy or stewy you want it to be. – Once it’s cooked for about an hour, we took out the chicken breasts and let them cool, and then instead of cutting up the chicken into squares, we shredded it, just using our hands. Then out all the chicken back in, stir it up, and let it sit for about ten minutes, and voila, it’s ready to be consumed! I’ve been making this dish for a couple of years now. It’s the perfect meal for providing some hearty and filling food on a hot day that doesn’t heat up the kitchen too much and doesn’t require too much work. 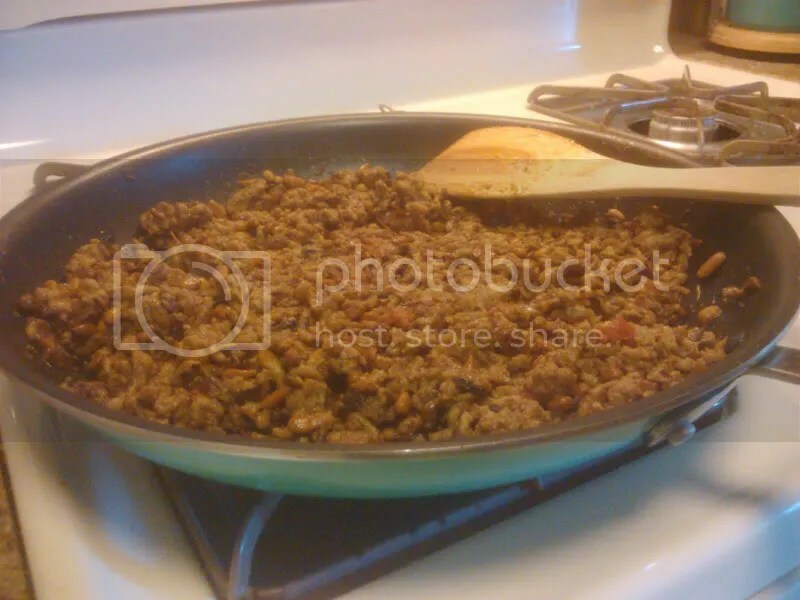 My wife found the recipe from the Food Network site and it goes by the name of Middle Eastern Chicken Sloppy Joe. We just call it Middle Eastern Sloppy Joe, because it’s shorter and also we use turkey instead of chicken, because we think it tastes better. Here’s the link to the recipe at the Food Network site. Heat olive oil in a medium skillet over medium heat, add the scallion whites cinnamon, salt, and pepper, and cook until tender, about 5 minutes. 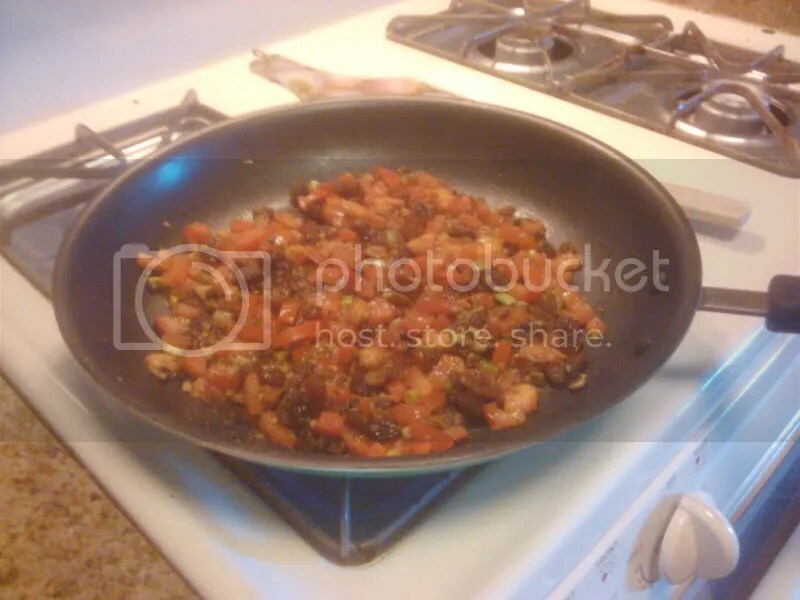 Stir in the garlic, tomato, and raisins and cook over high heat until mixture is almost dry, about 6 minutes. 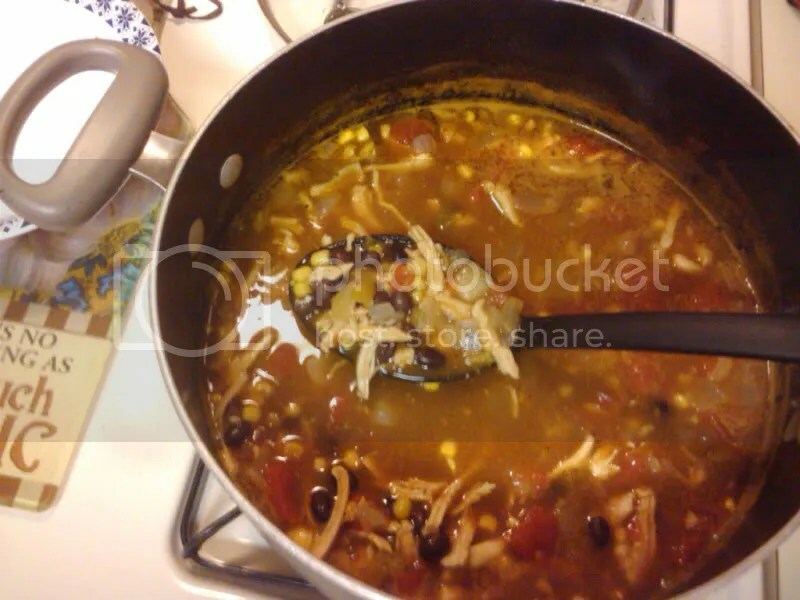 Add the chicken and cook stirring until meat is cooked through, about 5 to 6 minutes. Remove from the heat and stir in the green part of the scallions, yogurt, and pine nuts. 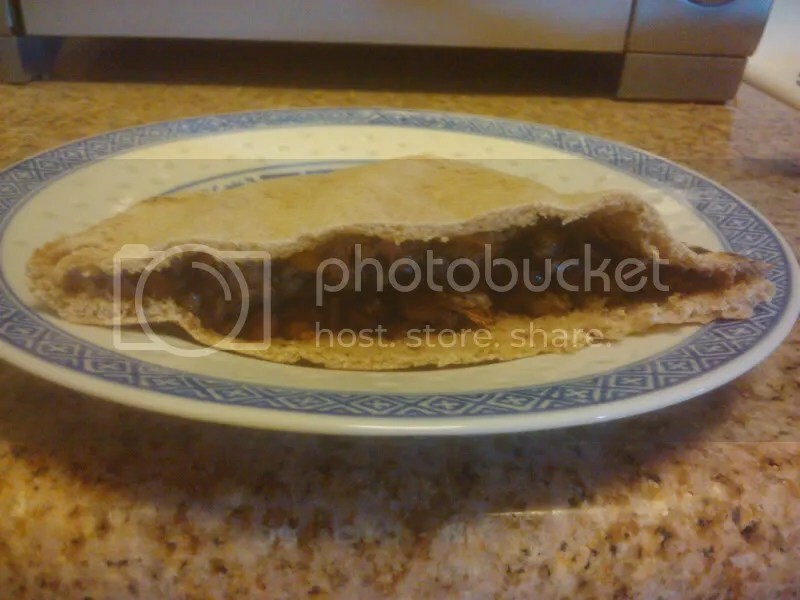 Serve mixture stuffed into warm pita with tomato slices and cucumber slices. 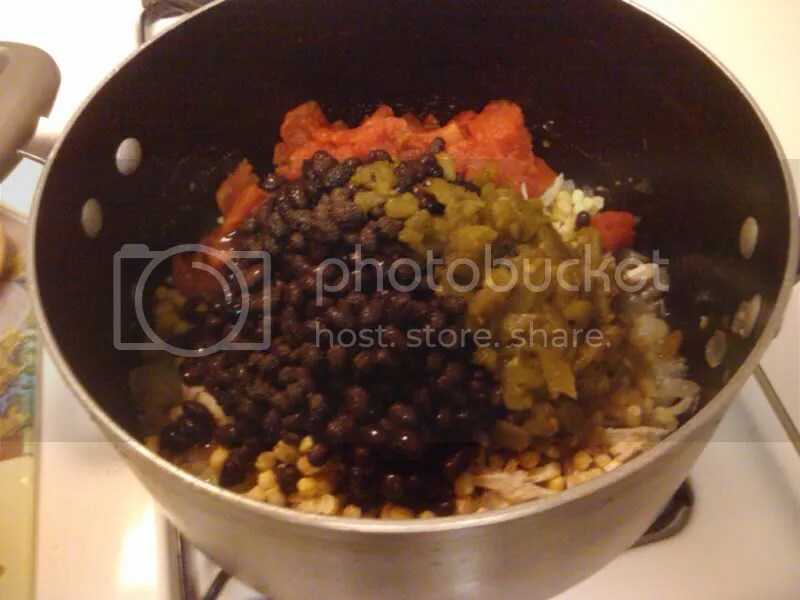 Here’s how it looks simmering with the initial ingredients of scallions, raisins, garlic and tomatoes, along with the cinnamon, it creates a delicious smell. Next the turkey gets added and cooked. 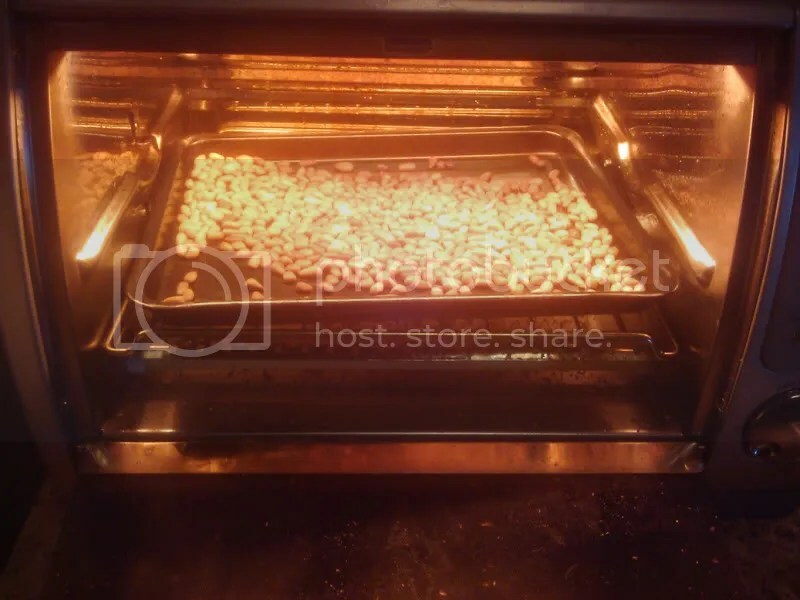 The pine nuts get toasted for about three or four minutes; just keep your eye on them so they don’t burn. And finally the nuts are added with the plain yogurt and it’s all mixed together and left for a few minutes to stew. And then you slice up your pita, put as much as you want in it, and enjoy! Last weekend marked the endeavor of our first time in making homemade enchiladas, and the results were more delicious than I ever could’ve expected, making this a required monthly meal from now on. The key ingredient that I thought really made the whole meal work was the use of a deli roasted chicken, which I picked up from Safeway on a Friday when it was on sale. Since I was already pretty hungry while preparing the meal, taking the skin and chicken off the bones led to multiple tasty tidbits while shredding the chicken, temporarily satiating the hunger. 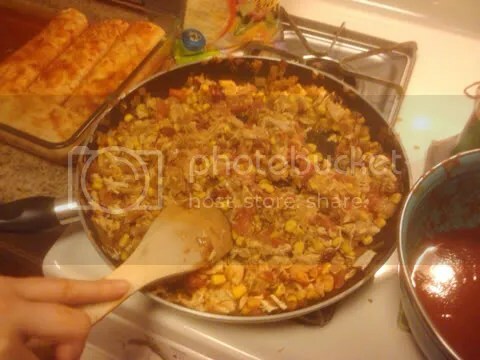 As more ingredients were added to complete the enchilada mix, the smells continued to get better, while the cooking dish looked more and more tasty. 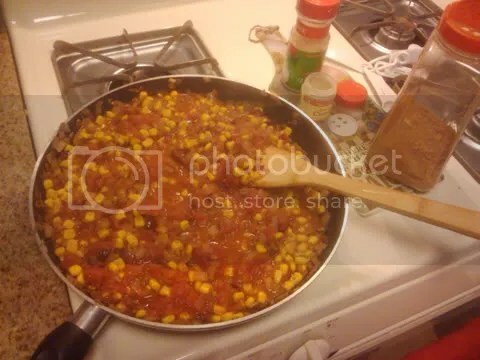 The tomatoes really helped to keep it moist, and another key ingredient that we added was sweet corn which just sweetened up the whole dish and balanced well with the spiciness of the peppers and enchilada sauce. 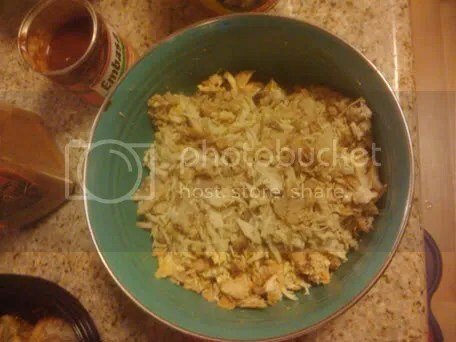 Then the chicken was added and the whole mix cooked for a little so the flavors and spices would soak into the chicken. 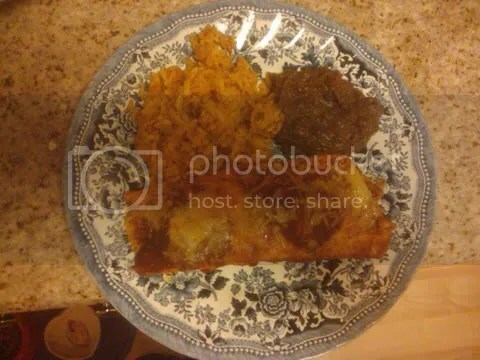 The tortillas were first dipped in the enchilada sauce, then the mix was added with liberal amounts of cheese, wrapped and added to the baking dish. 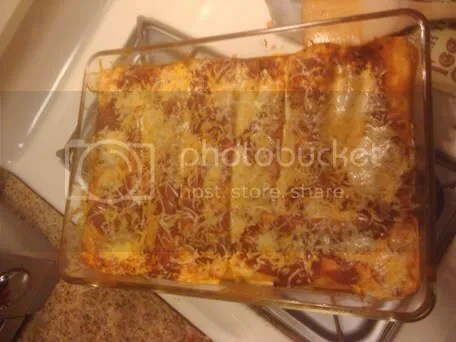 Once all the enchiladas were in the dish, more cheese was added, and the rest of the enchilada sauce drizzled over it all. Then it was tossed into the oven for fifteen minutes to bake a little, melt the cheese, crispen the tortillas and make everything just right.